Atlantic recording group Death Cab for Cutie has announced details of their upcoming fall tour. The dates – which see the 8x GRAMMY® Award-nominated band playing intimate venues and theatres across North America – begin September 24th at Eugene, OR’s Hult Center for the Performing Arts and travel through mid-October (see attached itinerary). Death Cab for Cutie pre-sales begin Wednesday, May 2nd at 10am (local). One dollar from each ticket purchased through the band’s website will go towards The Aurora Commons – a Seattle based non-profit organization which offers a safe space for unhoused neighbors to rest, prepare a meal, connect to resources, and collectively create a healthy and vibrant community. All remaining tickets will be released to the general public on Friday, May 4th at 10 am (local). For complete details, please visit www.deathcabforcutie.com. Death Cab for Cutie recently finished recording their highly anticipated new album, and today unveiled the first glimpse via a teaser clip featuring one of the tracks. The album will arrive in late summer and marks the first Death Cab for Cutie release to see long time bandmates Ben Gibbard, Nick Harmer, and Jason McGerr joined in the studio by new members Dave Depper (Menomena, Fruit Bats, Corin Tucker, Ray Lamontagne) and Zac Rae (My Brightest Diamond, Fiona Apple, Lana Del Rey, Gnarls Barkley). Depper and Rae have both been part of Death Cab’s touring band since 2015. For updates and more, please log on to www.deathcabforcutie.com. Meanwhile, Death Cab for Cutie are currently poised to embark on a limited series of international summer live dates, including headline shows in Amstelveen, NL and London – the latter set for June 18th as part of Robert Smith’s Meltdown at the Southbank Centre – as well as our own Salt Lake City, UT’s Red Butte Garden Amphitheatre (August 2nd) and Boise, ID’s Summerfield at Memorial Stadium (August 3rd). In addition, the band will be among the headliners at a number of upcoming festivals: Travelers Rest, curated by The Decemberists at Missoula, MT’s Big Sky Brewing Company Amphitheatre on August 4th and 5th, Life Is Beautiful Music & Art Festival in Las Vegas (September 21-23), and São Paulo, Brazil’s Popload Festival, set for November 15th at the world famous Memorial da América Latina. Death Cab for Cutie was born in 1997 when Western Washington University engineering student and budding guitarist-songwriter Benjamin Gibbard first united with guitarist-keyboardist-producer Chris Walla and bassist Nick Harmer to record a demo cassette dubbed “YOU CAN PLAY THESE SONGS WITH CHORDS.” Though Gibbard had initially conceived the tape as a solo project, the eight-song cassette proved both popular and aesthetically successful, prompting him to reconfigure Death Cab for Cutie as a full band. Death Cab for Cutie made their official live debut on November 22nd that same year, a performance recently uncovered and released as “FIRST SHOW, ACOUSTIC AT THE PACER HOUSE, BELLINGHAM WA. 11​/​22​/​97,” available now exclusively via Bandcamp; downloads begin at $4 with all of the band’s proceeds benefitting Seattle’s The Aurora Commons. Now fully affirmed as an era-defining band, Death Cab for Cutie made a stunning #1 debut atop the SoundScan/Billboard 200 with 2008’s RIAA gold certified “NARROW STAIRS.” More critical acclaim and two further GRAMMY® nominations followed, including nods for “Best Alternative Album” and “Best Rock Song” (honoring the hit single, “I Will Possess Your Heart”). “THE OPEN DOOR” EP was released in 2009, earning DCFC a third consecutive GRAMMY® Award nomination for “Best Alternative Album.” “CODES AND KEYS” arrived in 2011 and made a top 3 entry on the SoundScan/Billboard 200 before receiving the band’s fourth straight GRAMMY® nomination for “Best Alternative Music Album.” “You Are A Tourist,” the album’s first single, also proved a multi-format radio smash, reaching #1 at both Triple A and Modern Rock outlets nationwide – Death Cab for Cutie’s first-ever #1 at the latter format. Death Cab for Cutie’s eighth studio album, “KINTSUGI” made a remarkable chart debut upon its March 2015 release, debuting at #1 on Billboard’s “Top Alternative Albums” and “Top Rock Albums” charts, as well as #8 on the overall SoundScan/Billboard 200. 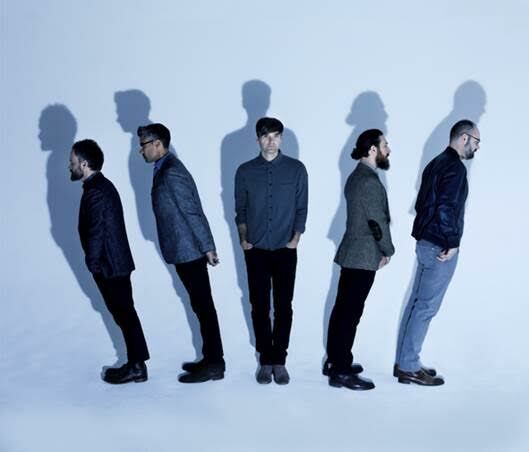 Hailed by Magnet as perhaps “the best record of (Death Cab for Cuties’s) 17-year career,” the album was honored with a “Best Rock Album” nomination for the 58th Annual GRAMMY® Awards – the iconic band’s eighth overall nod. For more news and information, please log on to www.deathcabforcutie.com.